1 Preheat oven to 350°F. Line 12 ( ½-cup) muffin cups with paper liners. 2 Bring about 1 inch of water to a boil in a large saucepan fitted with a steamer basket. Add beets, cover and steam until tender, 10 to 12 minutes. Transfer to a blender. Add buttermilk and puree until smooth. Reserve 2 tablespoons of the beet puree. Pour the rest into a large bowl. 3 Whisk flour, cocoa, baking soda, baking powder and salt in a medium bowl. Whisk egg, oil, 1 cup confectioners' sugar and vanilla into the beet puree in the large bowl. Stir in the dry ingredients until just combined. Spoon the batter into the prepared muffin cups. 4 Bake the cupcakes until a toothpick inserted into the center comes out clean, 18 to 20 minutes. Transfer to a wire rack and let cool completely. 5 To prepare frosting: Combine the remaining ¾ cup confectioners' sugar and cream cheese with the reserved beet puree in a medium bowl. Beat with an electric mixer until smooth. 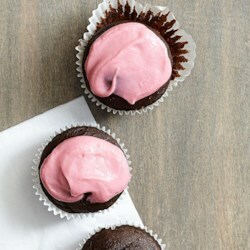 Top each cooled cupcake with a generous 1 tablespoon frosting.